Silensia is everything a sliding patio door should be. Discover the quietest, most thermally efficient door available on the market today. Clearly the Highest Value for Your Money. 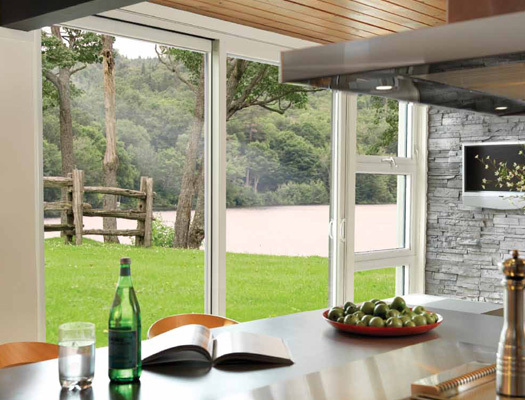 Silensia patio doors are designed to ensure the operating sashes slide quietly, smoothly and effortlessly, year after year. Its performance meets the highest standards in terms of energy efficiency and meets the latest Canadian and American energy standards. It allows for 1″-thick triple-glazed sealed units. And, it has an efficient division between the glass and steel reinforcement, significantly reducing the risks of condensation. With Silensia Sliding Patio Doors, you can look forward to many benefits. Vinyltek’s PVC (vinyl) doors, with their exceptional insulation, are among the most energy-efficient on the market. Our multichamber design reduces thermal exchange and, with more enclosed air space than other brands, increases insulation values—without the addition of costly, less recyclable insulating material. Enjoy the sound of silence! Multichamber profiles and multiple weatherstripping help eliminate most outside noise. Fixed and mobile panel rails meet and interlock perfectly, making removal from outside almost impossible. Lower sill design provides safer entry and exit. Installer-friendly design and room for panel adjustment mean uneven surfaces are never a problem—it’s a snap to plumb and square Silensia patio doors. Engineered to perform at DP 60 levels at all sizes up to 70-7/8″ x 79-1/2″, this door provides reliability that will stand the test of time, and is particularly watertight. Silensia sliding patio doors, it’s hard to imagine anything better! Discover the quietest, most thermally efficient door available on the market today. Discover Silensia. Connect with us for more information.